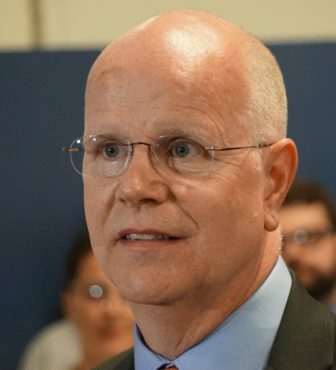 While avoiding any promise of windfalls, Comptroller Kevin P. Lembo pointed Monday to one positive trend as Connecticut approaches a crucial review of state income tax receipts. In his monthly report on state finances, Lembo noted that receipts tied to paycheck withholding — which represent roughly two-thirds of the state’s $9 billion-plus annual income tax collections — were particularly strong based on early filings in January and February. “While I have not yet incorporated it into my projections, one development is providing reason for cautious optimism on the revenue front,” the comptroller said, citing the withholding receipts. January and February also is the traditional season when bonuses are awarded in the financial services sector — a key part of Connecticut’s economy. “In part, this may be due to a successful year for Wall Street and the stock market, which benefits Connecticut residents who work in the financial services industry,” Lembo said. The comptroller noted that his New York state counterpart, Thomas DiNapoli, recently reported that bonuses for the securities industry in that state were up 17 percent over last year. “Of course broader and more sustained growth is needed to stabilize Connecticut’s budgetary position in light of the fiscal challenges facing our state,” Lembo added. Since what many economists call “The Great Recession” ended in June 2009, Connecticut’s finances have been plagued by two disturbing trends. Required contributions to public-sector pension and retirement health care programs have surged dramatically — even with a 2017 plan to mitigate a spike in the state employee pension system — because of decades of inadequate contributions and numerous early retirement incentive programs. At the same time, state income tax receipts — particularly those tied to the stock market and the financial services sector — largely have failed to grow at the fast rates they experienced throughout much of the 1990s and first decade of the 2000s. By law, state analysts project budget revenues three times each fiscal year, on Nov. 10, Jan. 15 and April 30. Legislators traditionally adopt the budget each year in May or June and rely heavily on that April 30 report to plan available revenues. And the report comes just two weeks state income tax filing deadline. Since the last recession, those late April reports generally have delivered bad news to lawmakers, downgrading revenue expectations for the upcoming year. But if income tax receipts rise this time, analysts could upgrade expectations for the fiscal year that begins July 1 as well. Analysts say the preliminary $20.66 billion budget for 2018-19 that was adopted in special session last October includes a General Fund that is anywhere from $165 million to $260 million out of balance. In addition, Lembo says the current budget’s General Fund is about $198 million in the red. Lawmakers are not required to close either shortfall before the regular session ends May 9, but leaders from both parties have said they would attempt to do so. And some legislators are interested in making other changes to the budget that also would require more resources. One of those changes involves mitigating or suspending entirely new restrictions on the Medicare Savings Program. Those restrictions, which could limit prescription medication benefits for as many as 113,000 poor seniors and the disabled, originally were scheduled to start in January, but then were deferred to July 1. To suspend those restrictions entirely in the coming fiscal year — which would help incumbents from both parties campaigning for re-election this fall — would cost an extra $93 million. In addition, many legislators regret a directive they gave Malloy last October when they adopted the budget — specifically, to achieve unprecedented savings after the budget was in force. The governor met one of those savings directives this fiscal year largely by withholding $91 million in municipal aid — much to the chagrin of legislators and municipal leaders. Still, contractual obligations and other factors actually left the governor little flexibility to do anything else and still meet the legislature’s directive. Further complicating matters, the preliminary state budget for 2018-19 not only includes another “targeted savings” directive, but orders Malloy to find $39 million more. Democratic legislators continue to challenge Gov. Ned Lamont on who should bear the largest burden of balancing the next state budget.